Los Angeles Police Chief William J. Bratton isn't going anywhere -- at least that's what he told the Los Angeles Times on Thursday. 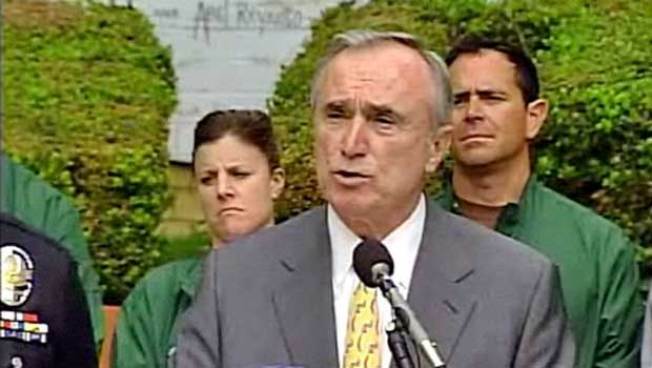 When asked what the Bratton-watchers of the world should read into the decision to sell, Bratton said he was not about to skip town for London, New York or anywhere else. If and when the house sells, Bratton said, he and Klieman will buy another place in or around L.A.
One reason for wanting to move? The pool at the house, which Bratton said he has used it all of two times since moving in and is a pain to maintain. Chief William Bratton puts up his Los Feliz home up for sale... asking price: $1.8 million. Why is he moving? Plans to leave Los Angeles? The one-story house, built in 1964, has four bedrooms and three bathrooms in 2,716 square feet. Described as an "architectural hacienda," the private walled and gated home has a courtyard entry, city light views, outdoor entertainment areas and a swimming pool surrounded by mature trees and landscaping. Inside the updated post-and-beam house are vaulted ceilings, hardwood floors and a redone kitchen. So for now, we can all relax. Bratton isn't going anywhere.